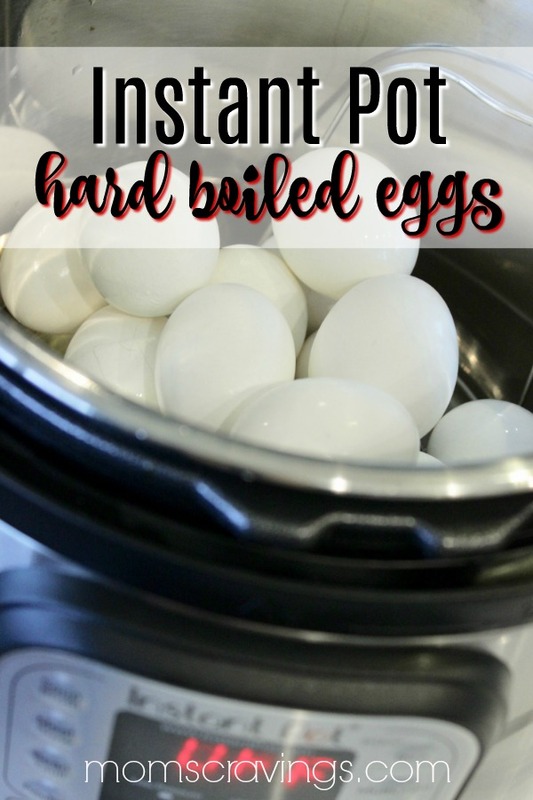 These Instant Pot Hard Boiled Eggs are Easier Than ANYTHING! 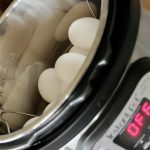 Instant Pot hard boiled eggs are the way to go! And, when you use the pressure cooker to make hard boiled eggs you’ll love that there’s no mess and the eggs are so easy to peel! Love your Instant Pot? Me too! See more Instant Pot recipes. OK guys, I have to admit that my Instant Pot hasn’t saved the day like others had claimed it did theirs, but I am here to tell you that this kitchen appliance has saved me some time and a hole lotta mess several times… Prime example being for making hard boiled eggs. 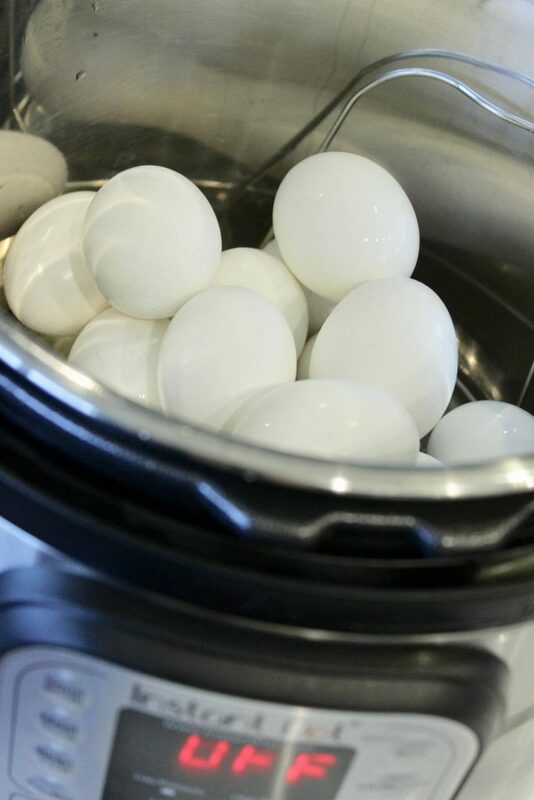 As I am writing this post on how to make Instant Pot hard boiled eggs mind you I have a lot going on. Easter is this weekend (GASP! wasn’t Christmas just here?!) and we are sliding into baseball season in full force (aka, goodbye weekends 🙁 ) Don’t get me wrong, I love, love, love watching our son play one of his dad’s favorite sports 😉 but that sport sure is a time killer. So, I forge on to find other ways to save time in my life, one being making hard boiled eggs in the Instant Pot. If you remember, I raved in my last pressure cooker post about making Instant Pot mashed potatoes. Ya’ll these are a life-saver. Straight up amazing. Lay the eggs in the bottom of the pressure cooker pot. You’ll want to use the rack that came with your Instant Pot. You could also use a steamer basket like this one. 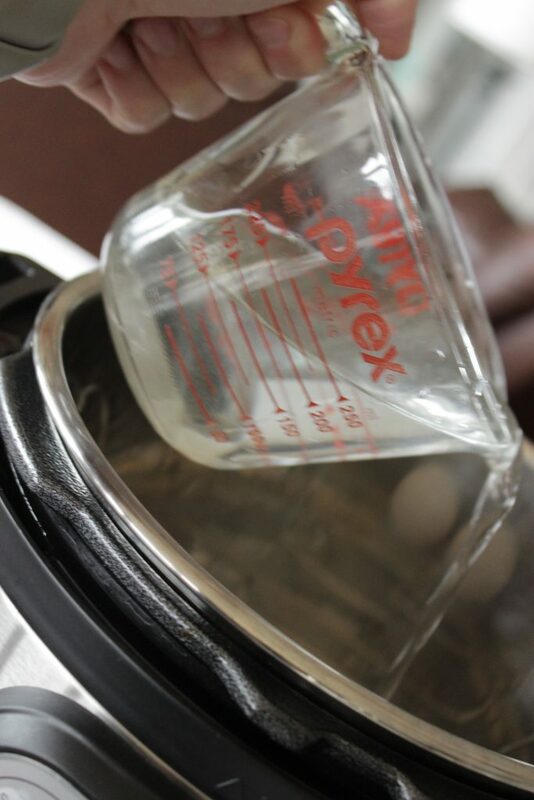 When you are thinking or wondering about how to hard boil eggs in Instant Pot or pressure cookers of any kind, you’ll want to remember the 5-5-5 Instant Pot egg rule. 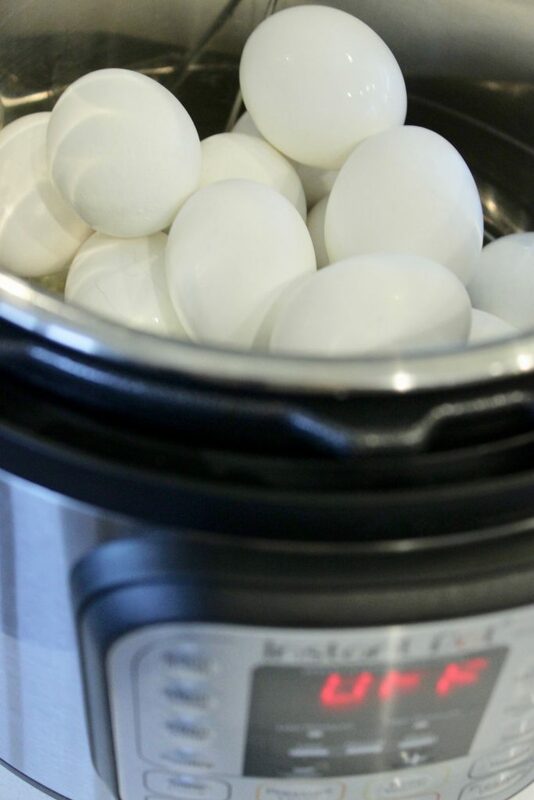 Wondering how easy it is to make hard boiled eggs in the Instant Pot? It's so stinkin' easy when you use my 5-5-5 rule. 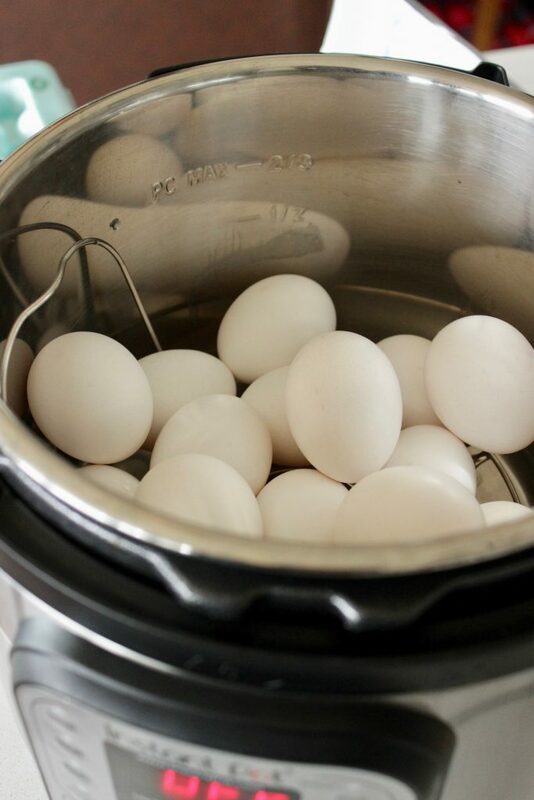 Eggs, water and your pressure cooker will have you on your way to mess-free hard boiled eggs in no time at all! Pour the water into your Instant Pot, and place the eggs on the rack that came with your Instant Pot. Close the lid and set the Instant Pot for 5 minutes at high pressure. To do this on some versions you'll press "manual" and then set the timer to 5 minutes. Depending on the temperature of water you use, it will take about 5 minutes to build pressure and then 5 minutes to cook. Set your timer for 5 minutes once the cooking is finished to let the eggs have some natural release time. After the natural release do a quick pressure release. Place the hot eggs into a cold water bath with water and ice cubes to stop the cooking process.